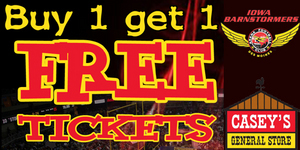 Casey's Teams Up With Barnstormers For Exciting Offer! 07/11/2010 4:07 PM - This Friday night, July 16th is Casey's night with the Barnstormers. Fans are encouraged to head to their local Casey's General Store, where they can pick up a voucher good for buy 1 get 1 FREE tickets to Friday nights game against the AFL's #1 team, the Spokane Shock.